Courtesy photo by Trout Unlimited Ed Northen, fishing guide and president of the Hemingway Chapter of Trout Unlimited, will talk about fly fishing in the winter at the next chapter meeting on Thursday. 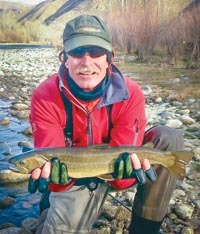 Northen is shown here holding a bull trout he caught while winter fishing on the South Fork of the Boise River. Intrepid angler Ed Northen will provide an inside look at the techniques and adventures of winter fly fishing at the next monthly meeting of the Hemingway Chapter of Trout Unlimited. The meeting is scheduled for Thursday, Jan. 10, from 5-7 p.m. at Whiskey Jacques’ Restaurant & Nightclub on Main Street in Ketchum. The public is invited and there is no charge for admission. Winter is a favorite time for Northen, a fishing guide and president of the Hemingway Chapter, to try his luck with a fly or nymph for catching trout in the Big Wood River, the South Fork of the Boise River or elsewhere. He said that despite the cold weather, fly hatches still occur in winter and fish can still be tricked by dragging a nymph across the bottom. According to a Trout Unlimited press release, Northen will discuss winter fly-fishing techniques, places to go and appropriate gear. In addition to being a fishing guide, Northen is a backpacker, trail runner, poet and rock climber.